Don't see it if don't liek 1-man shows, hate singing, opposed to french lyrics. See it if You like French Chansons, one person shows, great singing. Don't see it if You don't like musicals, you are in the mood for a plot-driven drama. See it if you love the music of Edith and Jacques. It is done very well! 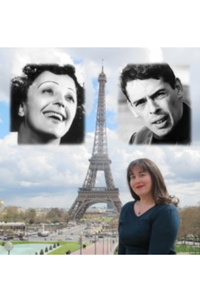 See it if You love French and Belgian music by Brel and Piaf - interred well and laced with background on both artists. See it if you enjoy the music of Piaf and Brel, and don't mind that it's all in French. ; you like a bit of history of the performers thrown in. Don't see it if you dislike French chanteuse. See it if you would enjoy listening to a solo performer sing the songs of Piaf and Brel for an hour and tell you a bit about their lives. Don't see it if you're expecting a Piaf impersonation. You'll be annoyed that most songs are sung in French without English translation. Don't see it if You're French; or Belgian: in spite of best intentions, the idea of an American singing in French may not be compelling. Also Ms Gall's engaging charm, gorgeous looks & spirit, combined with her slightly self-deprecating humor, wit & enthusiasm do much to carry the evening. She’s a wonderful entertainer & her love of the material is obvious. This, and her huge, well-trained operatic voice pull the audience right in; resistance is futile. See it if You like musical concerts featuring music of Piaf and Brel. Don't see it if You are looking for a traditional musical. See it if you love French cabaret music. The singing is marvelous. And there are some charming stories about Piaf, Brel and the performer. Don't see it if you expect to see a play. This is a recital with commentary. There is no attempt to inhabit either of the titular characters.